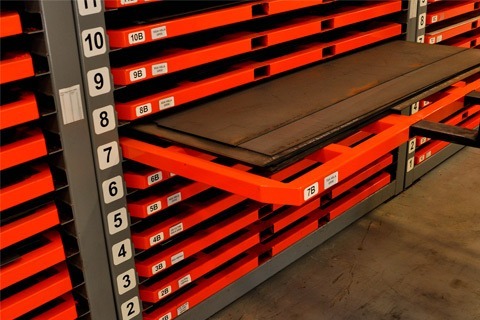 Big Steel Rack is an innovative sheet metal storage system that makes it easy to inventory, store and find the sheet metal your business needs to operate. The flimsy shelving systems of yesteryear are no longer an option when efficiency and safety are paramount for today’s businesses, and Big Steel Rack offers many benefits over traditional sheet metal shelving systems. Big Steel Rack storage systems offer three main benefits, read on to learn more and see video of these unique shelving systems in action. If you’re interested in learning more about Big Steel Rack and getting a quote for your facility, contact us today.